Vibration interrupts and stops unwanted barking. The Petsafe Vibration Bark Control Collar offers 10 combinations of vibration correction. The lengths of these vibrations are random and are meant to interrupt the dog's unwanted barking patterns and stop the barking. 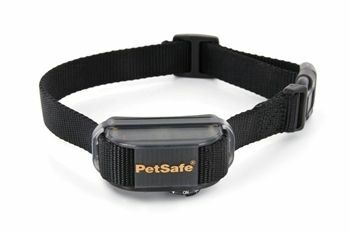 When the dog barks, vibration on this bark collar is delivered from one of the two vibration points that are set on the collar itself. WHAT IS COVERED: Radio Systems Corporation d/b/a PetSafe (hereinafter referred to as “PetSafe”) warrants to the original retail consumer purchaser, and not any other purchaser or subsequent owner, that its PetSafe product, when subject to normal and proper residential use, will be free from defects in material or workmanship for a period of one (1) year from the purchase date. An “original retail consumer purchaser” is a person or entity who originally purchases the product, or a gift recipient of a new product that is unopened and in its original packaging. When serviced by PetSafe Customer Service, PetSafe covers labor and parts for the first year of ownership; after the first year, a service or upgrade charge will apply relative to replacement of the product, with new or refurbished items at PetSafe’s sole discretion. The limited warranty is non-transferrable and shall automatically terminate if the original retail consumer purchaser resells the PetSafe product or transfers the property on which the PetSafe product is installed. In the event of defect, these are your exclusive remedies. MAKING A WARRANTY CLAIM: To obtain warranty service, call the PetSafe Customer Care center. In the United States or Canada, 1-800-732-2677; in Australia, 1800 786 608; in New Zealand, 0800 543 054.